﻿ The Amalgamations Group - Groups - Manufacturing - Tractors and Farm Equipment Ltd. Tractors and Farm Equipment Ltd. Tractors and Farm Equipment Ltd. (TAFE) has been the catalyst of change in the life of farmers in India by empowering them with modern technology products. TAFE has made meaningful contributions to farm mechanisation in India by offering a total package of tractors and farm equipment, plus training in mechanised farming and adaptive agricultural research. TAFE, in fact, has been a pioneer in the mechanisation of Indian farms. Established in 1960, TAFE started out by manufacturing and marketing a range of Massey Ferguson tractors and related farm equipment. The company has a collaboration with AGCO Corporation, USA – one of the largest manufacturers, designers and distributors of agricultural equipment in the world. In 2005 TAFE has acquired the tractor business of Eicher Tractors with its diesel engine plant at Alwar and transmissions plant at Parwanoo, through a wholly owned subsidiary, TAFE Motors and Tractors Limited (TMTL). 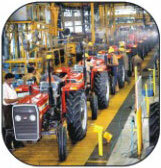 Today, it is the second largest tractor manufacturer in the world in sub 100 HP range. TAFE's vision is to be the first choice of the Indian farming community and is moving towards a growing presence in international markets. Manufacturing base for engineering plastics, production of tools and dies.